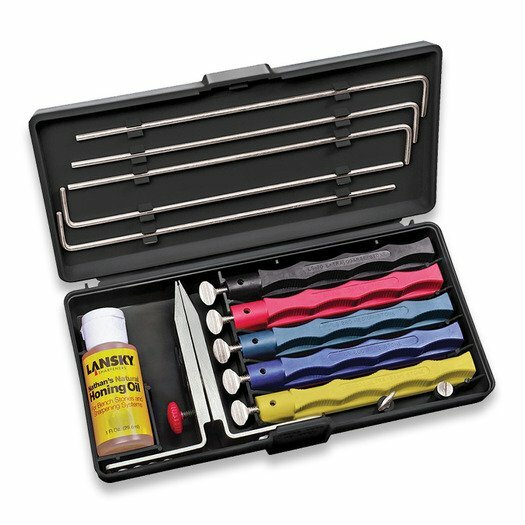 The Lansky Deluxe 5-Stone sharpening kit includes fine, ultra-fine, medium, coarse and extra coarse hones. All of Lansky sharpeners are produced with Ultimate in Knife Sharpening Systems Technology and Lansky Controlled Angle Sharpening System to give your blade a professional, razor sharp edge. Lansky Sharpeners is the most recognised name in knife sharpening worldwide. In addition to their legendary Controlled-Angle Sharpener System, they continue to develop new sharpening technologies and innovations for hunters and outdoorsmen, as well as for kitchen use.